The patch name ‘1.0’ suggests that it’s possible this is the last patch we’ll get before early access. The latest ESO Patch notes include a number of critical bug fixes. Most of the game-breaking quest bugs beta testers have encountered in the low-level areas should be fixed according to the patch notes. The Dark Elf racial passive Flame Talent was fixed overall, but also received an increase to fire damage bonus. The High Elf racial passive Elemental Talent was nerfed. Two of the last ranks for the passive were reduced, which puts it more in line with the other racials in game. 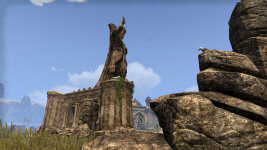 Until this point Elemental Talent on its own was a big enough reason to choose to play an Altmer if you were planning on mainly casting elemental spells – overall it increased your elemental damage by 6%. It will probably end up being +2% for the first rank and +1% for the last two ranks, putting it to +4% total increase to elemental damage, which is still a very decent bonus. Implemented the final cinematic you’ll see at the beginning of the game. Added all remaining orchestral music and VO. Fixed many issues that were impeding quest progress. Enemy players will no longer be able to get past Elder Scroll gates while the gate is closed, protecting the scroll within the temple. Keep assets should no longer appear invisible. Fixed an issue where the camera would go into third-person view when jumping and strafing right in first-person view. Fixed some issues with character animation transitions after dodge-rolling. Fixed an issue where shoulder pads on NPCs would float in the air while they scratched their head. Fixed frame-rate issues with Dark Anchors. Fixed an issue with female Khajiit with 3 face piercings not animating during conversations with NPCs. /torch has been temporarily disabled, but will return in a future patch. The remaining voiceovers and orchestral music have been integrated into the game. Balanced the audio levels in-game. Fixed numerous audio issues with UI, monsters, and ambience. You can no longer use /stuck while you are engaged in combat. Attempting to use /stuck while in Cyrodiil or any of the Cyrodiil delves will give you an error message. Note: This change is temporary. /stuck will be coming back to Cyrodiil soon, but it will use a different system. Fixed an issue so you can now break a crowd control ability while in the air from a knockback. Fixed an issue with charge abilities that could cause you to charge inside of monsters, rather than up to them. Fixed an issue where partially charged heavy attacks were doing more damage on sneak attacks than fully charged heavy attacks. Fixed an issue where the Dark Elf racial passive Flame Talent would not improve the damage of many spells. It should now increase all fire damage caused. Fixed an issue where the Dark Elf racial passive Flame Talent was adding a flat damage to fire damage rather than a percentage increase. Increased the bonus fire damage for the Dark Elf racial passive Flame Talent. Reduced the bonus elemental damage for the last two ranks of the High Elf racial passive Elemental Talent. Fixed an issue where the FX for Igneous Shield could become permanently stuck on you. Fixed an issue with Shadow Image where summoned shades were not disappearing properly when the ability was re-cast. Fixed an issue where you could become stuck when using Ball Lightning repeatedly. Increased the health restoration of Healing Ritual, and increased the magicka cost to match. Slightly reduced the radius of Healing Ritual. Adjusted the effect of Light Weaver on the Healing Ritual ability. Instead of reducing the ability’s cost, it now causes Healing Ritual to give 2 ultimate to you and each ally it heals. Reduced the damage debuff on the ultimate ability Nova. Fixed an issue where Vampires could reset the disease back to stage 1 when they died or went to a different zone. Fixed an issue where you could become stuck and unable to attack for a few seconds after casting the werewolf ability Pounce. You can now trade the Breton Racial Motif. Fixed an issue with jewelry enchants that reduce the cost of all spells. The progression should now be consistent across all levels and veteran ranks. Crow’s Wood: Fixed an issue where Rulantaril would not properly spawn on the Subdue Rulataril quest step in A Son’s Promise. Darkshade Caverns: Fixed an issue where the Defensive Instinct ability could be interrupted, and was missing its telegraph in The Hive Lord. Blessed Crucible: Fixed an issue where Talres Voren would get stuck if gladiators were killed before quest was activated in Fire of Battle. Wayrest Sewers: Fixed an issue where Uulgarg the Hungry’s ‘Terrifying Roar’ could be interrupted, and if you were out of range, he would cast the ability repeatedly until it hit you. Veteran Spindleclutch: Fixed an issue that would prevent the Blood Spawn boss from using his charge/cave-in ability. Replaced the weapon rack in the tutorial with tables. These tables now contain a sword and shield, a staff, and a two handed maul for you to pick up. Fixed an issue with several quests that would incorrectly despawn your pets, rather than removing the NPCs associated with that quest that needed to go away. Despawned or missing monsters that are critical for completing a quest. Missing objects that are critical for completing a quest. Groups completing quest content asynchronously. Moved the NPCs that take you back to your starter island to a closer and more visible location. Auridon The Veiled Choice: Fixed an issue where Eranamo could become your follower permanently. Harsh Lesson: Fixed an issue where Ilara would not spawn if someone else had already helped her. Entila’s Folley: Fixed an issue where the boss Bakihg would not spawn, preventing you from getting the achievement. Rightful Inheritance: Fixed an issue where Sorondil would not path properly when following the quest pin to his mother. Abandoned Mine: Fixed an issue where bosses and other monsters would not spawn in the ritual room if someone else had recently cleared the room. New in Town: Fixed an issue where Malareth’s quest marker would not update to her new location when turning in the quest. Tears of Amaya: Fixed an issue where your response to Niima’s greeting claimed you had done something that you hadn’t done yet. Fixed an issue where Trynhild Earth-Turner was swinging as if holding a sword, but actually had a bow in his hand. Unearthing the Past: Fixed an issue where the quest could be blocked if the Abomination of Hate became stuck. The Judgement of Veloth: Fixed an issue where The Keeper would not spawn at all on the quest step “Free the Spirits,” even after attempting to relog. Cold Blooded Vengeance: Fixed an issue where you could not burn ships to advance the quest. Ritual of Anguish: Fixed an issue where skull quest items could not be placed on the designated altar. Trial of the Ghost Snake: Fixed an issue where the dream effect would not clear after you defeated the Shadow Snake. Challenge the Tide: Fixed an issue where you could not interact with the signal horn more than once if someone else killed Gruznak. Bad Medicine: Fixed an issue where Grell would not appear, blocking all quest progress. Lost Crown: Adjusted the difficulty of the fight with Malana. Anchors from the Harbour: Fixed an issue where the Guardian attack sequence would sometimes start and stop incorrectly. The Dagger’s Edge: Fixed an issue where Foulwing in the Shrieking Scar would not spawn, even if you used the picked bones. The Dagger’s Edge: Fixed multiple issues that would occur after Foulwing was killed and you return to Lord Diel’s camp: On quest step “Talk to Bumnog,” Bumnog should now spawn without needing to relog first. On quest step “Talk to Lord Diel,” Lord Diel should now advance the quest correctly without having to leave the area or relogging. Cutting off the Source: Fixed an issue where Veilen would not always spawn. Wolves in the Fold: Fixed an issue that would prevent refugees from turning into werewolves when you used the quest amulet on them. The Lion Guard’s Stand: Fixed an issue where the rescue patrols would not always spawn. Wyrd and Coven: Fixed an issue where Mother Murk would not always spawn . White Mask of Merien: Fixed an issue where the journal needed for the quest would not spawn. Reclaiming the Elements: Fixed an issue where Guardians would not despawn if the quest was abandoned after they were summoned. Reclaiming the Elements: Fixed an issue where Guardians of Earth, Air and Water were not interactable. The Legacy of Baelborne Rock: Fixed an issue where Ellina would not always spawn, despite a quest arrow indicating her position. Scuttle Pit: Fixed an issue where the Spider Queen respawned too quickly. Bosmer Insight: Fixed an issue where you couldn’t enter the final room to get Brackenleaf’s heart. Cast Adrift: Fixed an issue where the quest step with Nistel would break if you chose the dialog option “Sergeant Firion said Torchbug Treacle might help. I’ll look for some on the beach,” and brought back treacle for her. Mistral: Fixed an issue where the banker in Mistral would not let you access your guild bank. Storm on the Horizon: Fixed an issue where Razum Dar would sometimes not advance the quest or travel to the next destination after the quest step “Talk to Razum Dar” of Captain Tremouille’s quest. Storm on the Horizon: Fixed an issue where a quest marker would sometimes not appear for the Boatswain to take you back to Auridon. Storm on the Horizon: Fixed an issue where quest markers for Razum Dar would sometimes not appear throughout the starter area quest line. Fixed an issue where Shalidor was missing his greeting dialogue before offering a quest. Tutorial: Updated the quest to give you a choice of three weapons at the start of the tutorial. Daughter of Giants: Fixed an issue where Lyris’ Axe was occasionally missing, blocking your progression. Daughter of Giants: Fixed an issue where leaving Coldharbour and returning midway through the quest would prevent you from advancing. Daughter of Giants: Fixed an issue where Lyris would not knock down the rock wall during her backstory quest, preventing you from advancing. Dutchess of Anguish would become stuck in the world and immediately respawn, possibly breaking the quest. Shadow of Sancre Tor: Fixed an issue where Mannimarco would become invisible if you died by his cold hands at least one time. Enemy of My Enemy: Fixed an issue where waypoints didn’t match the next step of the quest. Arithiel: Fixed an issue where the quest could be blocked if Cassio Varo fell out of the world. A Door into Moonlight: Fixed an issue where you got stuck cowering after praying, and ended up blocking the quest. Blood Cursed Town: Fixed an issue where the text “MONSTER” would appear in the conversation with the Mayor. Stonefang Cavern: Fixed an issue that was causing floating rocks and a large indent in the terrain. Proving Trust: Fixed an issue where you could not interact with the peasants to heal them. Divine Favor: Fixed an issue where you would be unable to summon either of the guard captains. Restoring the Guardians: Fixed an issue where Blaze and Ragebinder would not always spawn. Restoring Order: Fixed an issue so that interacting with the dresser will progress the quest for those playing either solo or grouped. Davon’s Watch: Moved Holgun so he’s a little easier to find. Norvulk Ruins: Fixed an issue where Nariam would not respawn for a short amount of time for those that did not receive the achievement for killing him, if another member in their group killed him first. Simply Misplaced: Fixed an issue where you would have to leave the Mages Guild building and re-enter to make Valaste appear in order to progress the quest. Izad’s Treasure: Fixed an issue where the Buried Treasure could not be interacted with once dug up. Fixed an issue where Soralfa Meadblood was missing her VO lines. Added the final opening cinematic. Updated the profanity filter word list. The location dropdown in the Group Tools window has been expanded to better support localized text. Fixed an issue where completing a quest while in a conversation would not automatically track a new quest if one was granted during the same conversation. Items that have a sell value of zero no longer display a value in their tooltips. Fixed an issue where a crash would occur when entering spawned portals in first person mode.